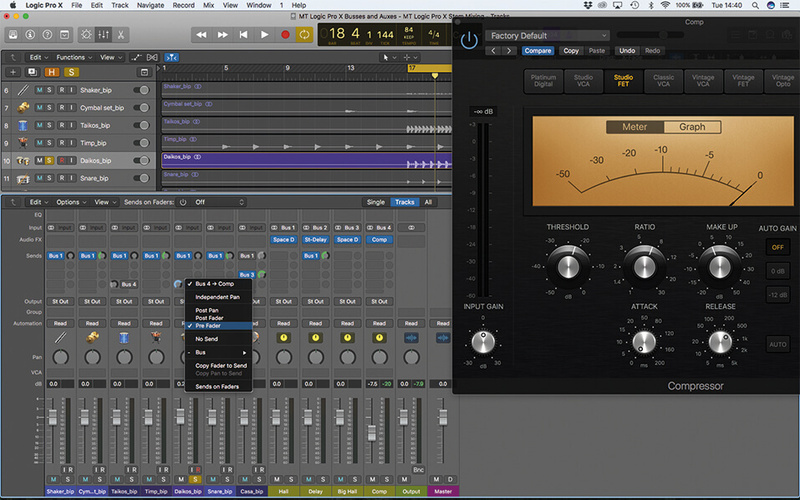 Intelligent use of bus sends and aux channels can unlock the full power of Logic Pro X’s mixer. In this tutorial, we explore their full functionality. Bus (also spelt buss) sends and aux channels are an essential part of working with Logic’s mixer, covering everything from custom headphone mixes through to reverb and other forms of ‘parallel’ effects processing. Like many aspects of Logic, though, it’s easy to overlook the full functionality of what buses and aux channels have to offer, or indeed, the various new features that have been added to the use and application of bus sends and aux channels that can really aid your workflow. In this workshop, therefore, we take a ‘back to basics’ look at what bus sends and aux channels can offer and why a more refined application can benefit your production. In simple terms, bus sends are most commonly used as a means of applying send effects like reverb and delay – treatments that might want to be shared over multiple tracks or instruments, as well as setting a mix between ‘wet’ and ‘dry’ signals (or effected and un-effected, in other words). 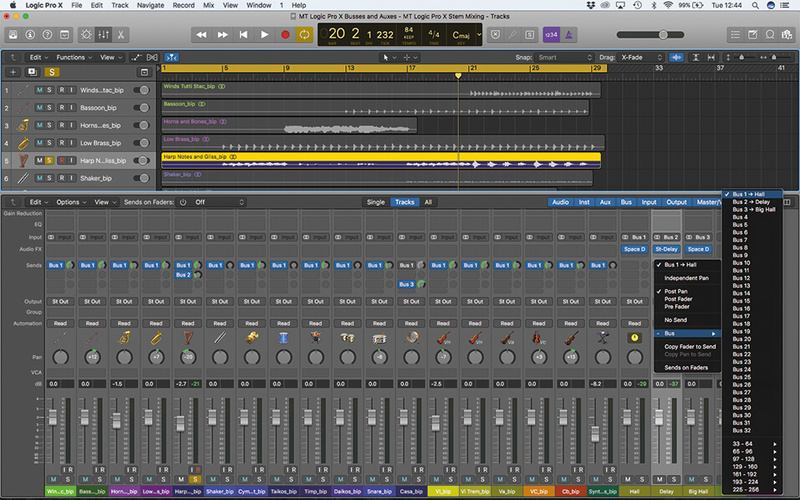 This contrasts with the application of an effect such as EQ that is placed as an insert across a single channel strip. Used an insert, only a single channel can access the plug-in and, in most cases, there isn’t any interest in setting a wet/dry ratio. bus sends can be inserted into your mixer using the send slots, found just above the channel’s output assignment. If you intend to have multiple channels sharing the same reverb, it’s worth shift-clicking the faders so that the bus send is inserted into all the channels at once. When you create a bus send, Logic will create an accompanying aux channel, which becomes the destination point for all the respective bus sends. Effects (like reverb or delay) then inserted on this aux channel will be applied to all the instruments using the bus sends, at an amount defined by the bus send level – the greater the bus send level, the greater the amount of effect. 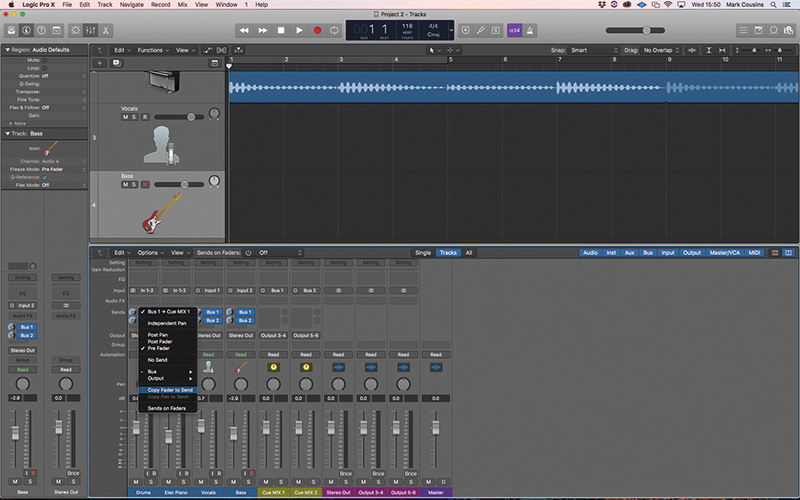 One useful feature for setting the amount of effect applied is the Sends on Faders option. 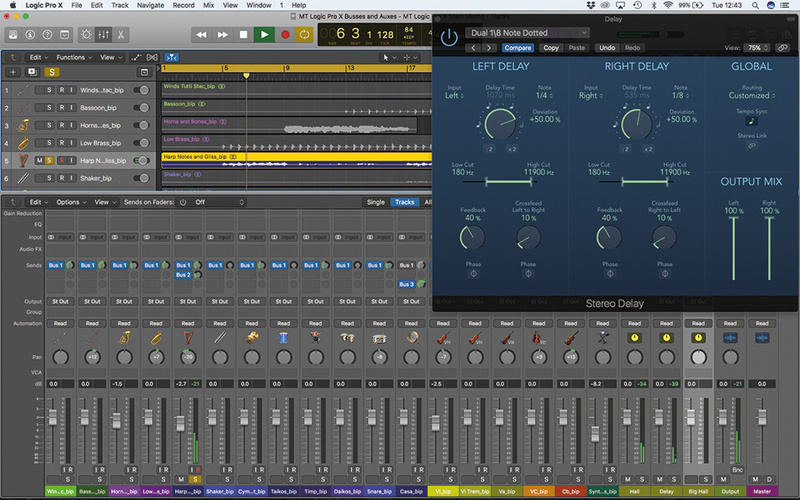 Rather than setting the effect level using the small bus send controls, Logic flips the main faders so that they work as the send levels. Obviously, the Sends on Faders option makes it much easier to fine-tune precise send levels (between -1dB and -1.5dB, for example), but its biggest advantage is the ability to visualise the ratio between instruments. In the case of reverb, for example, the fader almost becomes a means of pushing the instrument further back in the acoustic space – the higher the fader, the further from you the instrument becomes. Moving beyond the application of reverb, bus sends can perform a range of additional production and mixing tasks. First of these is the lost art of dedicated headphone mixes, where musicians hear a distinct and separate version of the track to the monitor mix heard in the control room. A singer, for example, might need to hear their vocal loudly in the mix, or a piano-heavy mix to help with their intonation, whereas the control room will usually want to hear a more musical balance. Adjust the send levels accordingly. 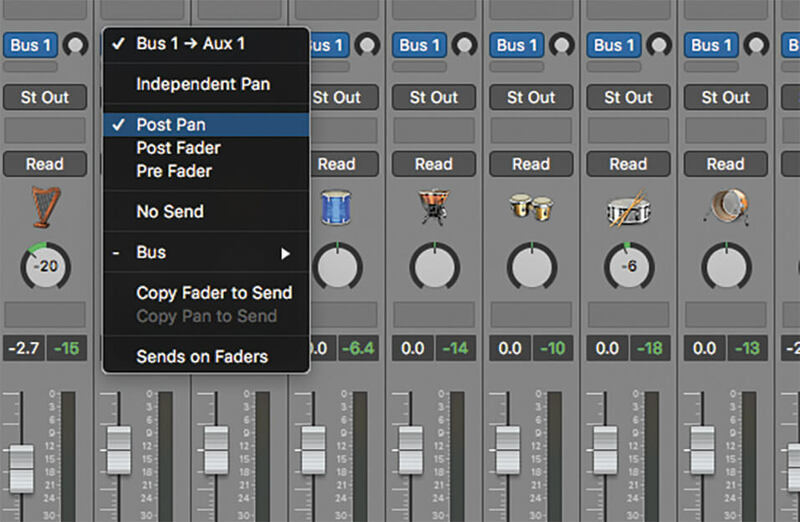 The use of bus sends for headphone mixes highlights the difference between pre-fader and post-fader bus sends. In the example of reverb, the bus sends default to a post-fader application, so that the reverb is applied after the fader level is established. Turning down the instrument in the mix, therefore, will result in correspondingly less reverb being applied. With a pre-fade headphone mix, the bus send works ahead of the fader, so, irrespective of the fader level in the main mix, the musician will hear their mix at a consistent volume level. Another interesting use of buses is the application of effects like compression as send effect – or, in other words, parallel compression. In this example, one or more channels gain access to a ‘heavy handed’ compressor, which is then blended back into the main mix to create varying amounts of body. This is a good example where both pre- and post-fade setups have their merits. 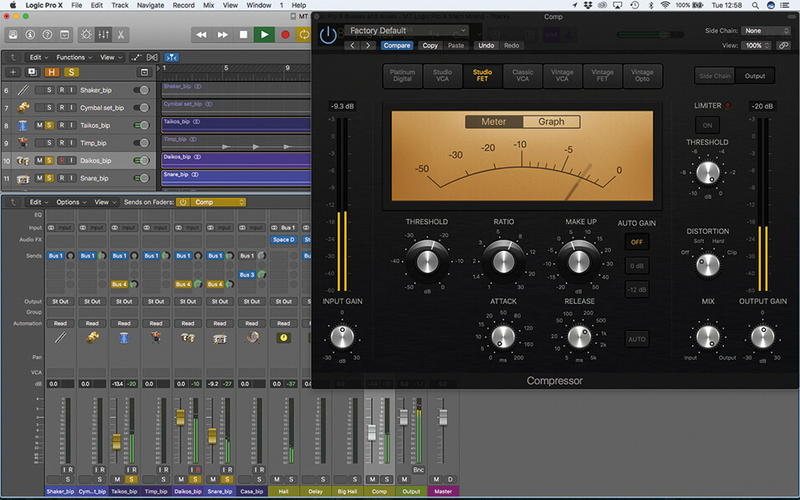 With a post-fade send, the instrument’s level in the mix has a direct relationship on the behaviour of the compressor. Turn the instrument up, therefore, and the compressor works harder. If you need a more consistent form of parallel compression, there’s a strong argument for using it pre-fader, so that the amount the compressor is driven remains the same, irrespective of fader level. 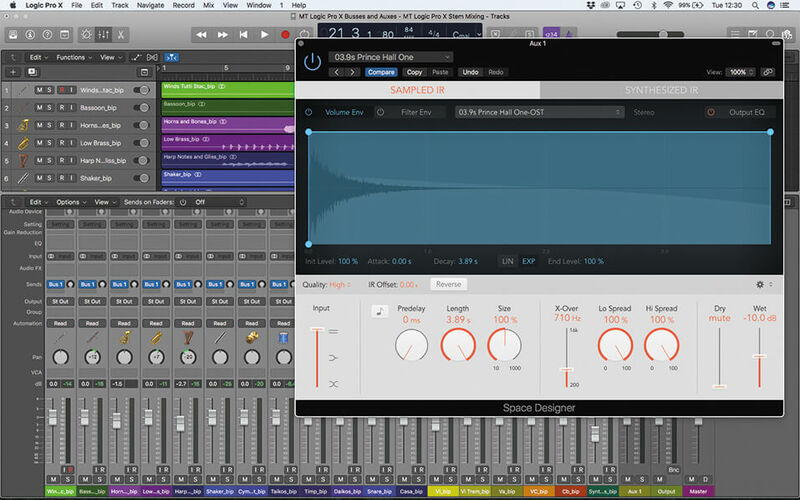 In this example, though, you’ll need to group the aux channel to the channel fader, so that turning down the instrument also attenuates the amount of parallel compression being returned into the mix. 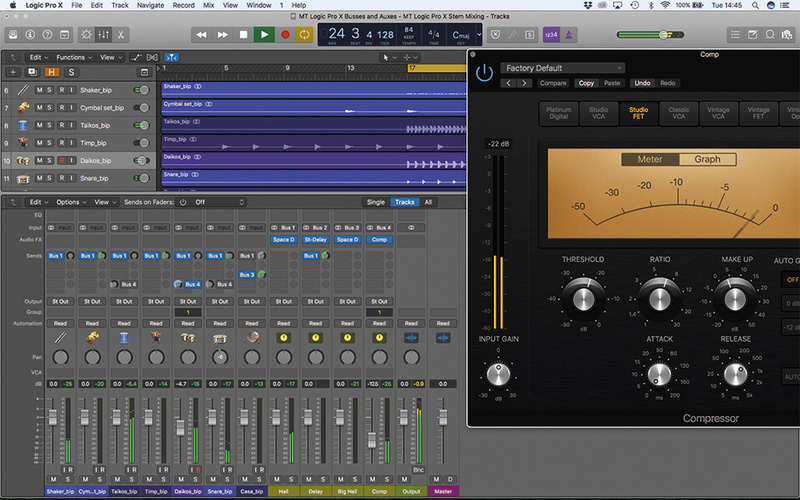 bus sends and aux channels might not seem the most exciting part of Logic Pro X, but their use and application are certainly vital to an effective production – whether that’s in respect to musicians delivering their best performance or creating a more dimensional and exciting mix. 1. Open Project 1, which contains an unmixed track. Select all the channel faders and then insert a send to bus 1 from the first send slot. Instantiate Space Designer across the newly created aux channel. 2. Check the status of the bus send. For the application of reverb, you’ll want the send set to Post Pan, so that both the fader level and the pan position dictate the position and amount of reverb. 3. You can set the reverb level with the small send controls, or alternatively, use the new Sends on Faders feature (on the top of the mixer) to see all the respective send levels on the main faders. 4. With Sends on Faders active, raising the fader is the equivalent of pushing the sound further into the reverb. 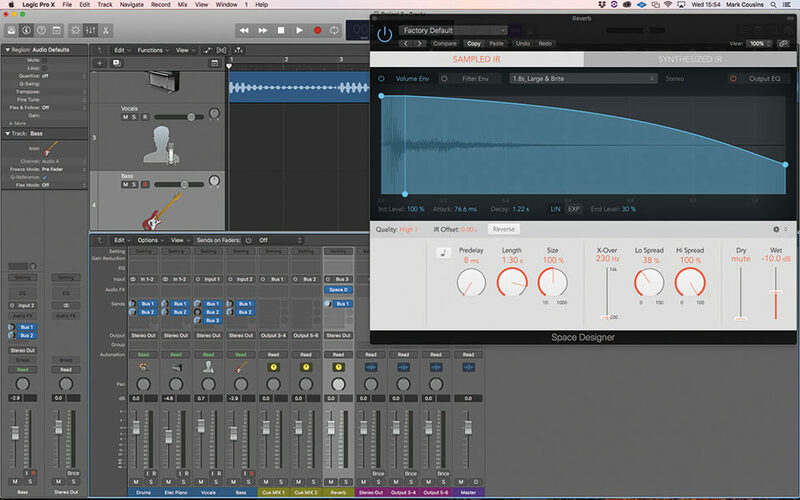 Try creating a varied soundstage with some instruments having a greater amount of reverb than others. 5. To keep the mix visually clear, I usually keep the respective bus sends correct to their horizontal alignment – bus 2, for example, appears on slot 2, and so on. Try adding some delay to the harp. 6. One flexible addition to note is the ability to create more sends from the aux channels, thereby routing effects to other effects. Here, we’re adding reverb to the delay taps on the harp. 7. Bus sends aren’t just for reverb and delay. 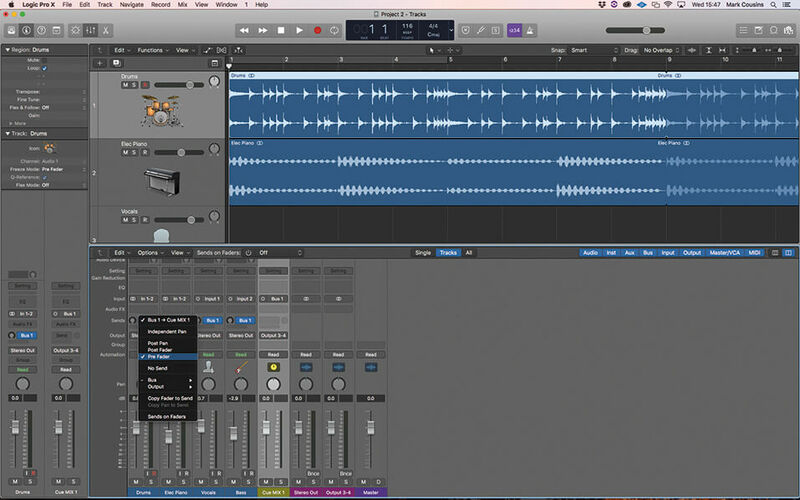 In this example, we’ve applied compression – using a post-pan bus 4 send to the Daiko drums. We’ve picked the 1176-like Studio FET as our compression type. 8. The compression needs to be pushed hard, using an 8:1 ratio and yielding -5 to -10dB gain reduction. Use the fastest attack setting (the transients need to be squashed), and a medium release around 500ms. 9. 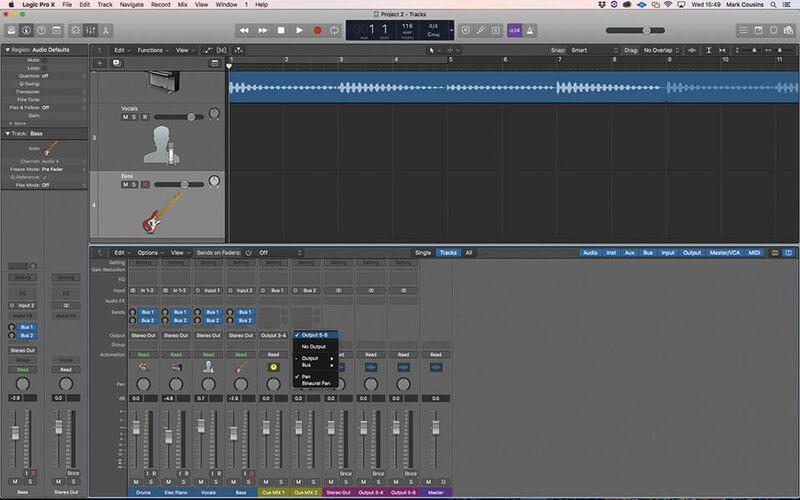 Use the aux channel level to set the depth of the effect. 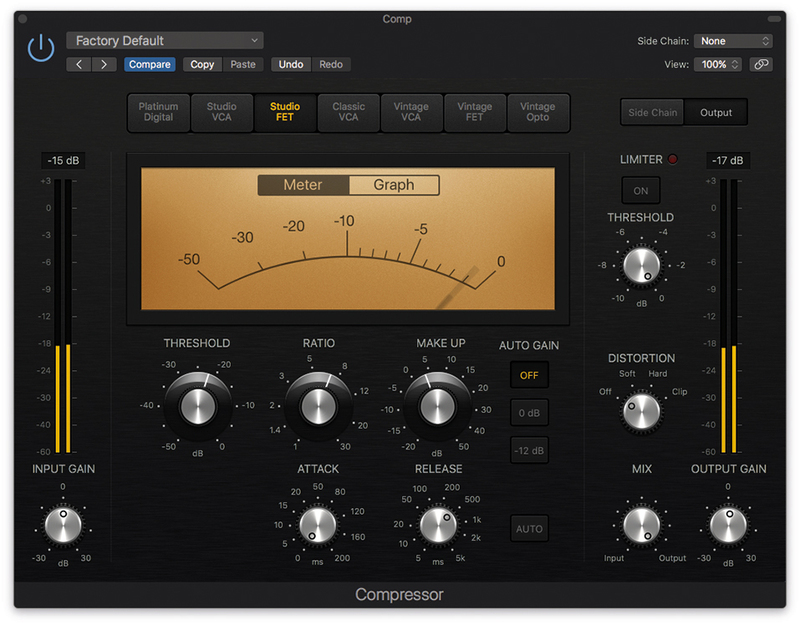 As the compressor is applied in parallel, you have the option of adding additional instruments. Note how the additional instruments affect the compressor’s behaviour. 10. Changing the fader level will, of course, change the behaviour of the compression. Try switching to a pre-fader send, therefore, so that the compression is driven the same irrespective of the channel fader level. 11. If you use a pre-fader send, you’ll want to lock both the compression and the source channel/s as part of the same group. 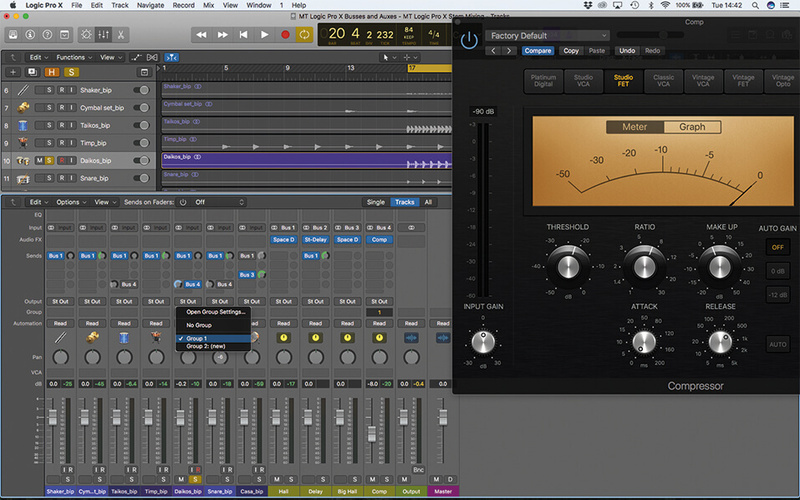 Attenuating the instrument in the mix will then reduce the amount of parallel compression. 12. Listen to the results in the context of the mix. Notice how the loudness and body of the drum track changes, even with relatively small amounts of the parallel compression bled back into the mix. 13. Open Project 2 so that we can explore cue mixing. The session has two backing tracks, and it assumes we’re recording vocals and bass at the same time. 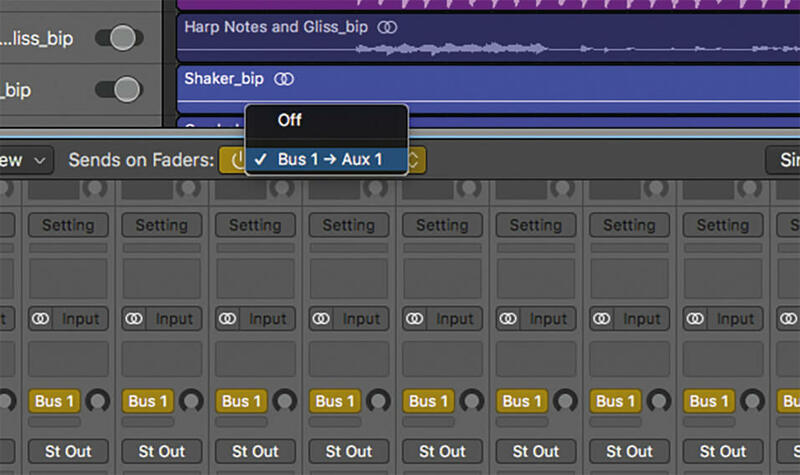 Create a pre-fade bus send for all tracks. 14. Create another set of pre-fade bus sends, which will be for our second cue mix. The aux channels should be routed directly to the same outputs that the musicians’ headphones are connected to. 15. Click on either bus send and from the drop-down menu select Copy Fader to Send. 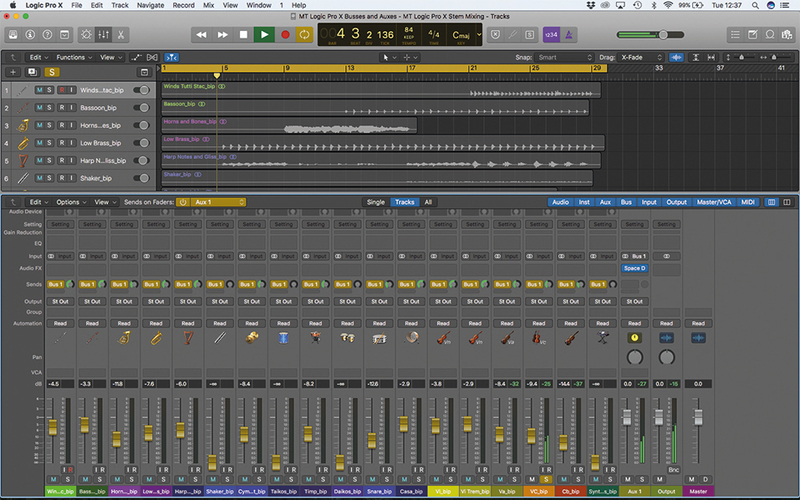 This will duplicate the current monitor mix for either of the musicians (depending on the bus you select, of course). 16. Using the Sends on Fader option is a quick way of checking and adjusting each of the cue mixes using the main faders. Adjust the balance to extract the best musical performance from either musician. 17. The singer might want to have reverb to help with their intonation. 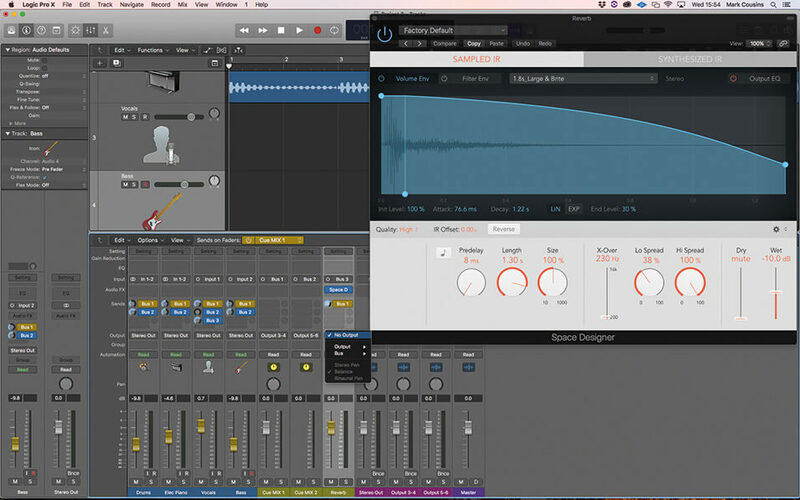 Create another pre-fade send from the vocal channel, instantiate a reverb on the new aux channel, and then create a pre-fade bus send from the reverb. 18. 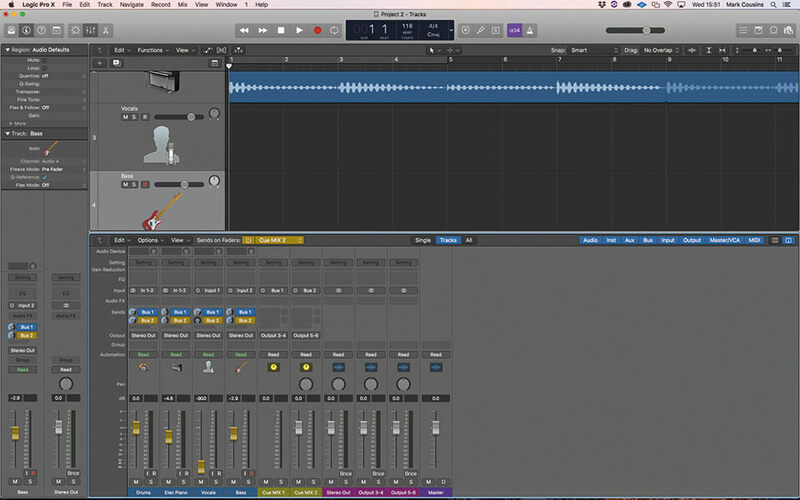 Remove the reverb channel’s output assignment so that you don’t hear it in the monitor mix. The reverb level heard by the singer can be adjusted using the send level on the aux channel.